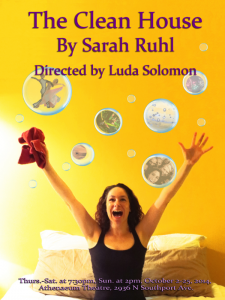 Bluebird Arts, a new Non-Equity theatre founded by Luda Solomon, is proud to announce the The Clean House, by Sarah Ruhl as their Fall 2014 production. Solomon will direct. The Clean House (runner-up for the Pulitzer Prize) is a romantic comedy written by Sarah Ruhl, an American playwright from Wilmette, Illinois. The play focuses on Matilde, a Brazilian cleaning woman who would rather be a comedian and come up with the perfect joke than clean a house. This theatrical and wildly funny play is a whimsical and poignant look at class, comedy and the true nature of love. Bluebird Arts’ production will feature Jaimelyn Gray (Matilde), Deborah Hearst (Virginia), Joe McCauley (A Man/Charles), Susan Steinmeyer (Lane), and Laura Sturm (A Woman/Ana). The production team includes Carl Ulaszek (Technical Director), Rick Sims (Sound Design), Natasha Dukich (Costumes Design), Lindsay Bartlett (Dialect Coach), and Anna Lafontant (Stage Manager). Founded in 2014, Bluebird Arts is a Non-Equity company established in Chicago, Illinois. The nonprofit organization’s purpose is to enrich, educate and entertain the community by sharing intimate stories, which focus on the genuine problems of real people. For more information about Bluebird Arts call 773.526.3628. Or visit our website at www.bluebirdsarts.org. Founded in 2014, Bluebird Arts is a Non-Equity company established in Chicago by Luda Solomon, who will serve as Artistic Director. The nonprofit organization’s purpose is to enrich, educate and entertain the community by sharing intimate stories, which focus on the genuine problems of real people. Dale Goulding, former Artistic Director of the European Repertory Company (ERC) will serve as Executive Director, and Jaimelyn Gray of TUTA Theatre Chicago will serve as Managing Director.